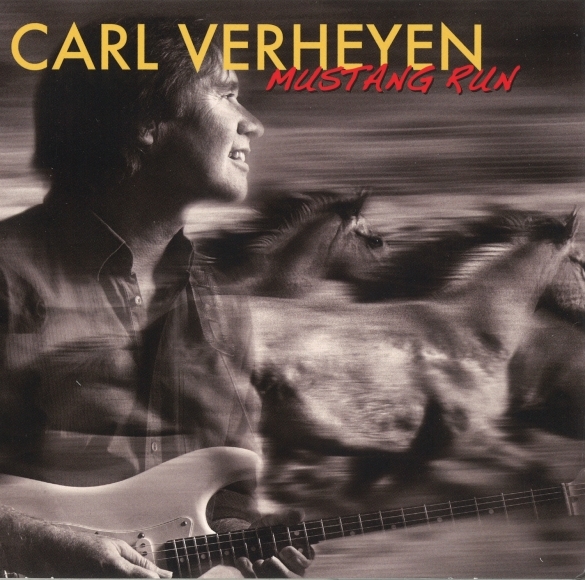 Los Angeles, CA – Much to the excitement of guitar players and Supertramp fans worldwide, guitarist Carl Verheyen has released his new CD ‘Mustang Run’. In his 40-plus years of playing the instrument, Carl Verheyen has created a wildly successful, multi-faceted career. He is a critically-acclaimed musician, vocalist, songwriter, arranger, producer and educator with 11 CDs and two live DVDs released worldwide. Carl is commonly regarded as a guitar virtuoso capable of playing any style of music with remarkable mastery and conviction. He has been one of LA’s elite “first call” session players for the past 25 years, playing on hundreds of records, movie soundtracks and television shows. Carl has graced the pages of countless industry publications and been the subject of numerous articles chronicling his rise to the forefront of the modern day guitar scene. Carl has won numerous polls and musical honors in the US, Germany, France, Italy and the UK. A member of the smash hit British rock group Supertramp since 1985, Carl has played to millions of enthusiastic fans in sold out arenas worldwide. As the creative force behind The Carl Verheyen Band, he has released an impressive and eclectic discography that showcases his endless talents across a wide array of musical genres. Carl’s musical influences are just as diverse and range from George Harrison, Eric Clapton, Mike Bloomfield, Alvin Lee, Leslie West to Miles Davis, John Mclaughlin, Steve Morse, Chet Atkins and Andy Summers, among others. On the educational front, Carl has produced two instructional videos called ‘Intervallic Rock Guitar’ and ‘Forward Motion’ as well as various on-line lessons. He also has a book/CD detailing his unique “intervallic” style called ‘Improvising Without Scales’. Another book entitled ‘Studio City’ is a compilation of all the columns Carl wrote for Guitar Magazine between 1996 and 1999. He has written a monthly column for Chitarre, Italy’s #1 guitar publication as well as Guitar World and Guitar Jam Daily, a website devoted to serious guitarists. He currently writes a monthly column for Guitar Player, contributes to other guitar publications, and blogs regularly for GuitarPlayer.com and his own site. Carl also lectures and teaches at clinics and master classes regularly when not on the road. In support of Carl’s new CD release, he will be touring Europe in the fall 2014. His band will feature bass virtuoso Stu Hamm (Joe Satriani, Steve Vai, Ritchie Kotzen, Billy Sheehan, Jeff Berlin), who is featured on ‘Mustang Run’, and master drummer/percussionist John Mader (Joe Satriani, Booker T, Electronic Arts’ “The Sims”, Tony award winners “Rent”, “Lion King” and “Wicked”). This entry was posted on Monday, June 30th, 2014 at 02:50	and posted in Carl Verheyen, Press Release. You can follow any responses to this entry through the RSS 2.0 feed.